Congratulations, you are getting together your very own home office! Whether you are starting from scratch or redecorating a current space, this post will help with all the essentials you need to have. Creating your home office doesn’t have to be a daunting task, especially when you have a list of home office essentials to help you along the way. The first essential is a computer of course. Likely, you will be doing a lot of work on the computer you choose, so it’s imperative that you pick wisely. Desktops and laptops have their own appeal, and it all depends on how mobile you want your home office to be. You may even choose to go with both! If you can only choose one, go with the one that you think you will get the most use out of, and get one that fits with your lifestyle. Don’t forget that you can usually hook up a laptop to a second monitor if you need more room to work! Now that you have your computer of choice, it’s time to find a desk for it. Having a desk in your home office is essential, and there are so many desks to choose from in today’s age! You don’t have to follow the standing desk trend although an option. Get one that honestly works with your lifestyle. You may want to get a tall standing desk, an “L” desk, or you may want to stick with a traditional desk. Go to a few office supply stores or check out stores online and see what types of desks they have for sale. Pick the one that you could see yourself working on, that also fits in your office without taking up too much space. Chances are you will be sitting down for a significant portion of your day if you don’t go for a standing desk. You can’t pick up just any chair for your office. Be willing to spend a bit of money so you can find a chair that is going to support your body. If you don’t have a good chair, you will see that you spend less time in your office, and more time working in other areas of your home. A chair will make or break the functionality of your office because if you don’t feel comfortable enough, it’s easy not to want to work in your office. Also if you are too comfortable, you may fall asleep. Put a lot of consideration and thought into the office chair that you get. Lighting is critical in the home office that you build. Having proper lighting will help you sustain working throughout the day. Most people stop at just getting lighting, but if you can, get lighting with multiple settings. There are many desk lamps that have multiple dimness and color settings that you can choose from depending on what you need at the time. Having a light with various settings means that you can work longer once your current lighting becomes draining on your eyes. Being able to print things off or send certain papers back to people is crucial. Especially if you handle a lot of paperwork like contracts or outlines/notes. You need to be able to get information to and from your home office quickly. If you have a small office, you want to find ways to combine things like printers and scanners that can take up a lot of space on their own. If you have more space in your office, many standalone printer and scanner options may be able to do their job more efficiently. Overall, though, combined options have come a long way in the last several years. If you need a printer or a scanner, chances are you also need a filing system. It’s so easy to let your office get cluttered, but you shouldn’t have papers everywhere! Purchase a filing system so that you can organize all your physical paperwork as necessary. You may also want to consider a digital filing system. This will help you keep up with all your stuff online. Accidents happen, and you may lose access to your physical copies, so it’s always a great idea to use a scanner to upload important documents to the cloud. Having an internet connected home office is important so that you can get work done, do research, and connect with colleagues and employers. Most things online require a certain amount of internet speed to do efficiently. So skip the low-speed internet, and make sure that you swing for internet that is at an appropriate speed for what you want to do online. You want your internet connection to make your life easier, not harder. So figure out what you would like to use the internet for, and get a speed that corresponds to that level of activity. For example, if you knew that you had to upload seven videos a week online, it wouldn’t make sense to go with the lower internet package. You would have so much wasted time per week watching videos upload when you could have just bought a higher internet package, and spent less time uploading videos. The next home office essentials are industry appropriate software. Each industry requires different software for the computer, so it depends on what you need to succeed in your job. You want to make sure that your desktop or laptop is loaded up with this software. This will allow you to succeed while working at home, and so you don’t have to go outside of your home to have access to the software. Industry software can get rather expensive, so you want to think about how much you would use the software before you purchase your own copy of it. Furthermore, if you work for an employer, they may be able to provide the software for you free of charge. If you are hooking up your computer or other electronic devices to electricity, you want to go for something that has surge protection. You don’t want a surge to cause damage to your computer or other electronics! Replacing a computer can be damaging, and not only in a financial sense because so many important documents and memories are stored on computers. Be careful when you are choosing a power strip, you want to make sure that the strip does offer surge protection because not all of them do. Make sure your home office reflects you and that it is a calming environment to be in. When you have a barren office that does not inspire, it’s hard to convince yourself to stay in it and work there. Your office can be a significant source of inspiration that makes you want to stay and create. So you need to pick office decor that uplifts you. Add some greenery with a few plants, put up a few pictures of your family, get some interesting artwork, and make your office your own. If you have a lot of sensitive documents coming into your office weekly, invest in a paper shredder. Paper shredders are great because they tear up your documents and make them nearly impossible to piece together again. They also save a considerable amount of room in your trash can if you get the correct shredder. You don’t want to just throw out sensitive documents that list things like your social security number or other important private information. Having a paper shredder can be an excellent way to get rid of records and documents. If you only shred a few documents a week, this may not be a necessary purchase. However, if you find yourself shredding a lot of paper, this would be a worthwhile investment over spending a ton of time per week doing it by hand. Working from home can get noisy. If you don’t have proper soundproofing in your home, a great way to reduce or cancel out some noise is to get a pair of noise canceling or reducing headphones. Getting noise canceling headphones is a relatively inexpensive solution. This will help you focus on your work and get more done. If you live in a relatively noisy house, construction is going on around your home, or you just like to work in silence investing in a pair of good noise canceling headphones would benefit you significantly. When your home office is located in an open space, it’s easy to get distracted by other people (and animals) who live with you. When everyone can quickly come and go from your office as they please, it creates a hard to control working environment for you. Instead of dealing with that distracting environment, try to put your office in a room with a door of some sort. A bonus is one that can be locked. If your office is in a space that can be locked by, people have to knock to be let into your space. This is great for shutting out distractions and spending more time doing the work that you need to do. Having a planner or calendar readily available in your office is essential. This is even more important if you conduct a lot of meetings on a day-to-day basis. You want to be able to schedule things appropriately, giving yourself plenty of time to make it to any meeting that you have planned for any given day. Give yourself the options of both. Schedule meetings in a physical agenda and digitize it, especially if multiple people need to have access to your schedule. Try the route with a mixture of physical and digital planning. This not only allows you to see your daily schedule when you sit down at your desk but also on the go. Either way keeping up with your day is necessary so that you don’t miss any meetings, deadlines, or that class you signed yourself up for. Backing up files should become a part the routine for any home office. Having a thumb drive is one of the most overlooked necessities of any home office. Thumb drives, in particular, allow you to move files from computer to computer, bring files with you on the go, and allow backups of important documents. More computers are moving to no CD-ROM drive requiring the need for a USB hard drive even greater. Thumb drives come in all shapes, sizes, colors, and speeds. There are even drives that look like surfboards and skateboards vs the standard USB stick. Thumb drives can almost become a decoration these days. Last, but not least, you need to keep healthy snacking options in or near your office. It’s so easy to go for unhealthy snack options, but they just fill you up and make you groggy. Find snack options that will fuel you, without making you sleepy or making you sick. You don’t want to skip meals while working, but you also don’t want to drag through an entire day of work because you ate something that wasn’t good for you. Keep a few light, healthy snack options around you at all times. Especially if you can have them in your office. This way you can work for more extended periods of time without getting distracted by hunger. Also there will be no need to walk to the kitchen and face other random distractions like kids or pets. 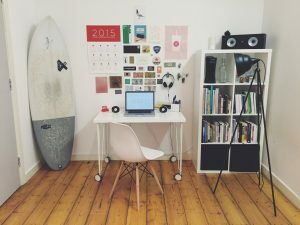 With this list of home office essentials, you will be able to create an office that truly helps to stay focused, get work done, and take advantage of the office space that you have. What you include in your office and the layout of it can truly make or break productivity. You want to make sure that you have all the office essentials within reach at all times.